I'm not sure what possessed me to write more math, but here it is. I wrote a while ago about some math relating to the upcoming Faction War payout changes. I thought I’d clarify a few things, break a few things down into smaller chunks, as well as address several concerns that people have had. There are two types of items in the LP store. There are those that require LP and ISK, and there are those that require LP and some sort of item. For the purposes of this scenario, we will completely ignore any speculation, assumptions, and etc. and do a straight up comparison of Inferno mechanics with Retribution mechanics, using Generic Item X. 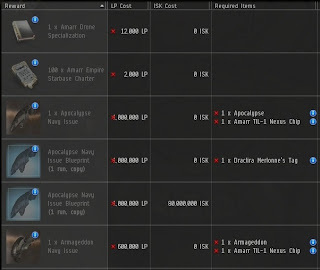 Generic Item X has an average market price of 100 million ISK, and a base cost in the LP store of 50,000 LP. In addition, it requires either 50 million ISK, or an item that is valued at 50 million ISK. We will perform separate calculations for variable ISK and fixed item type. In Inferno, we have LP store scaling and LP payout scaling. The store scaling scales the LP AND the ISK Base Requirements, but not a fixed item requirement. In Retribution, we will have payout scaling, but not store scaling. All prices and requirements in the store will remain at BASE value, with the LP payouts fluctuating based on your Tier level. The math at this point is pretty easy. I will give the basic formulas of how each is found, but we don’t really care about the actual numbers, so I will not go into those details much. To find the LP made per hour, you will multiply your base (I’ve chosen 50,000) by the payout scale factor for the Expansion you are looking at. Another important calculation we need to make is the value of the LP in terms of ISK. Again, we are completely stripping out any speculation, so we don’t care about item sell price fluctuations, mineral prices affecting required store item prices, prices tanking due to market dumping, or the million other factors that could affect things. (We can talk about that in a different post.) We’re just looking at the straight up comparison based on one fixed base number. 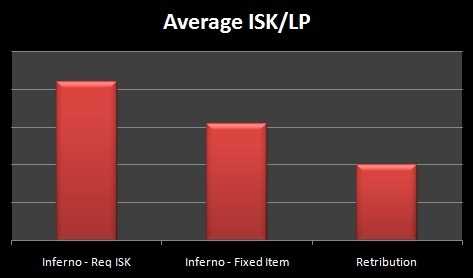 Since in Inferno our warzone Tier affects the cost of items in the LP store, our ISK/LP varies based on which Tier you are at. However, in Retribution, this is not the case since the items in the store will always cost the same. To find your ISK/LP, you simply subtract the ISK/Fixed Item cost from the item’s Base Average market price, and then divide by the LP cost. Since Retribution doesn’t have any store cost scaling, we have one value for ISK/LP for every Tier. This is the calculation we’re particularly interested in, because these numbers will allow us to compare Inferno income with Retribution income. To calculate this, simply multiple your ISK/LP result by your LP/Hour result, for whatever Expansion and Tier lvl you are looking at. I chose to move away from line graphs, since we don’t really care about what happens ‘between’ Tiers. You either have the Tier or you don’t, and you don’t get different benefits for being half-way to one tier or another. Any time your Retribution bar is higher than either of your Inferno bars, this means that the income in Retribution at that tier is greater. If the Retribution bar is shorter, it means that the income is less at that level. 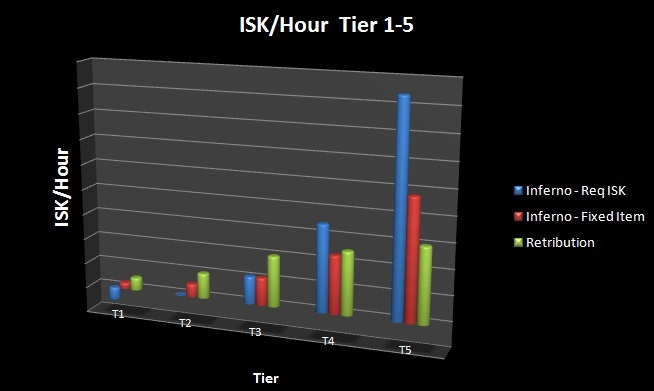 As you can see, income at Tier 5 is significantly reduced, especially for items based on variable ISK amounts. At Tier 4, it depends on your item type. (Variable ISK or Fixed Item) All other tiers are seeing a significant increase in income in Retribution. This second graph shows a comparison of average income. 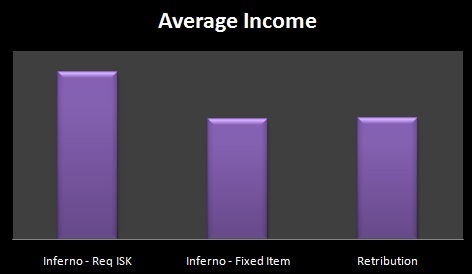 (Average across all five Tiers) As you can see, the average income in Retribution is lower than both Inferno averages, though the difference between Retribution and Inferno – Fixed Item is very small. This third graph shows the average worth of LP. However, from a real-world standpoint, considering that most people have been cashing out at Tier 5, it will be a significant nerf to the current FW population’s income. The ‘cap’ or maximum amount of ISK/HR you can make at peak conditions will be significantly less. However, the maximum amount of ISK/HR you can make under the worst conditions will be more. LP after Retribution will be worth less ISK, though more of it will be generated. "The Math Behind Faction War 3.0"
great write up! good to know. looks like ret will do just what it sets out to do. you are missing something critical. in inferno you grind LP for days at tier 1 and cashout in the minutes when it hits tier 5.
there is incentive to hit tier 5 for short periods of time to cashout. in retribution there is little incentive to "push" to tier 5 as the cost remains high but the benefit is only applied to current work, not the last week / month work. Is not the main incentive for reaching tier 5 that the opposition give up? What I suspect CCP wants and most FW bandwaggoners don't want is a situation where FW is a bitter pvp struggle with both sides usually around Tier 2.
tier 5 gives income in the region of 400m per hour. tier 4 is around 180m per hour. from my own experience some time ago. FW shouldnt have to wait till winter to be fixed. it would be better for eve as a game if it was fixed now. What they decide to do, if anything, with regards to mission running and diagonal plexing will determine how easy it will be to maintain tiers. Not familiar with FW, what is diagonal plexing? Diagonal plexing is when one side plexes for their allies. So say a Minmatar FW guy wants to help their allies in Gallente FW (or doesn't have anywhere to plex in peace), he can go to Caldari space and plex there. The Minmatar guy still gets LP for their LP store, but if I remember correctly it doesn't grant Victory Points, so it doesn't actually help the Gallente increase their warzone control. By using an artificially high amount of 50% of the sales price for the potential isk cost you artificially increase the way inferno seems to pay when its the blue bar. There are very few if any popular items where the blue bar will be what you suggest. If an item requires isk it is usually closer to 10% of the sales price. If you run the same analysis using an isk/item cost of 10% of the sale price of the faction item the blue bar will be much closer to the red bar.